The Papio-Missouri River Natural Resources District (NRD) is leading the process of updating the 2011 Multi-Jurisdictional Hazard Mitigation Plan (HMP). A HMP is a community-guided document that identifies vulnerability to natural and man-made hazards, and mitigation measures to reduce or eliminate this vulnerability. Having an approved and updated HMP in place is a requirement of the Federal Emergency Management Agency (FEMA) for communities, counties, school districts and other groups to be eligible for pre- and post-disaster mitigation grants, which are available on an annual basis as appropriated by congress. These federal grants allow for up to a 75% cost share for a wide variety of projects listed in the plan. The Papio-Missouri River NRD’s existing HMP was approved by FEMA in August 2011, and FEMA requires that the HMP must be updated and approved within a five year period. To view and download the current HMP, please click here. Hazard mitigation planning includes working with participating communities, the NRD, agencies and other stakeholders to prioritize and complete projects designed to make communities safer and ease potential damage from disasters. According to FEMA, every dollar spent on hazard mitigation planning results in a four-dollar savings on post-disaster cleanup and rebuilding. JEO Consulting Group, Inc. is assisting with this plan development update. Furthermore, a planning team leading the update consists of representatives from the Papio-Missouri River NRD, Burt, Dakota, Douglas, Sarpy, Thurston, and Washington Counties, representatives of the Nebraska Department of Natural Resources (NDNR), and the Nebraska Emergency Management Agency (NEMA). Residents, communities, counties, schools, fire departments, hospitals and more from throughout the Papio-Missouri River NRD were invited to participate in this process by attending meetings and providing information for the plan. For more information on the Papio-Missouri River NRD, please go to their website. The Kick-Off Meeting for the Papio-Missouri River NRD Multi-Jurisdictional Hazard Mitigation Plan was held on February 19, 2015 in Blair, NE. Members of the Planning Team met to discuss the planning process, outline goals, project schedule, upcoming meetings, methods to get communities involved, and much more! The One-Day Hazard Mitigation Workshop for the Papio-Missouri River NRD Multi-Jurisdictional Hazard Mitigation Plan Update was held on April 7, 2015 in Blair, NE. 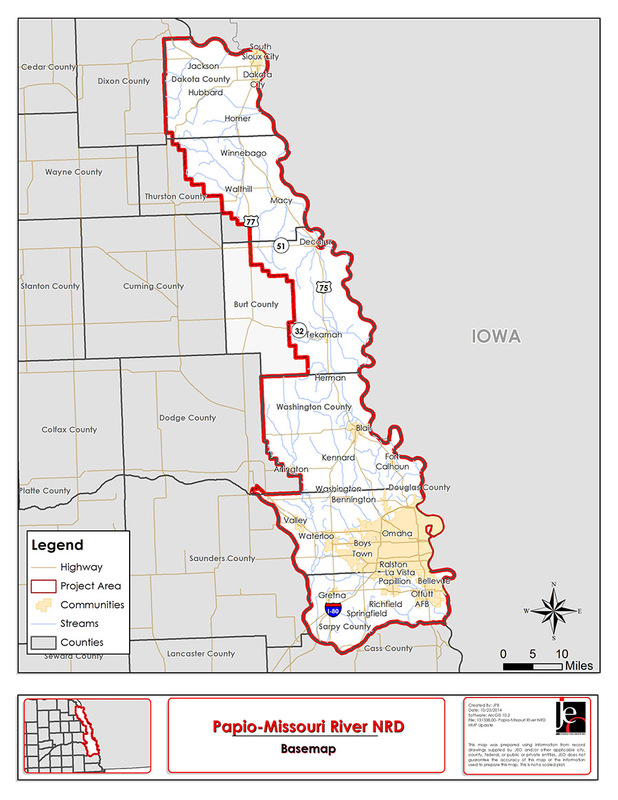 The following jurisdictions were represented at the workshop: Papio-Missouri River NRD; Burt, Dakota, Douglas, Sarpy, and Washington Counties; City of Blair, City of Bennington, Dakota City, City of Fort Calhoun, City of Gretna, City of Omaha, City of Papillion, City of Ralston, and South Sioux City. The workshop started with a tornado scenario table top exercise where attendees were put into small groups for discussion. This exercise was then followed by an introduction to hazard mitigation, risk assessment, identifying mitigation projects, and public outreach. Six Round 1 meetings were held across the Papio-Missouri River NRD between April 28 and May 13, 2015. Members of the communities that attended the meetings identified hazards of greatest concern, reviewed an early draft of the participant section, answered risk assessment questions, and completed the mitigation status update worksheet. Round 2 meetings were held between August 31 and September 9, 2015. Representatives from participating communities and schools attended a meeting to identify new mitigation projects and to review the second draft of their participant section. Thank you to everyone that was able to attend the meetings! The HMP Planning Team was informed Wednesday, June 8th, 2016 that the regional Hazard Mitigation Plan has received FEMA’s approval. At this time, we are requesting that participating jurisdictions begin the process of adopting the plan. The governing board for EACH participating jurisdiction will be required to adopt the plan before they are eligible to pursue any hazard mitigation grant assistance. JEO has provided draft adoption resolutions to each county emergency manager, and they are also available for download on this webpage. When your jurisdiction has passed the adoption resolution, we ask that you provide (via email or USPS) a copy of the adoption resolution to the JEO team. These resolutions will be forwarded to NEMA for their records and inserted into the final version of the plan that will be provided to the participating jurisdictions. If you have any questions about the plan or the adoption process, please contact the JEO team or your county emergency manager.